Taylor County Schools Superintendent Roger Cook discusses a district project a recent board meeting. Cook submitted a letter to the Board of Education announcing his retirement, effective June 30, at Tuesday night's meeting. Roger Cook wanted to come back to his hometown and be a school superintendent. Eight years ago, he did just that, taking over the position for the Taylor County School District. But on Tuesday night, Cook said it is time for him to step aside and retire. 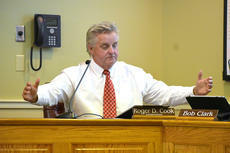 Cook made the announcement during Tuesday night’s Taylor County Board of Education meeting. He will retire at the end of June, finishing out this school year. However, Cook noted in an earlier interview with the Central Kentucky News-Journal that the possibility of retiring earlier was still open if “something crazy happened” with pension legislation in the Kentucky Legislature. Earlier this year, Cook agreed to a two-year contract that paid him $180,000 annually. Cook joined the Taylor County School District as superintendent in May 2009, following long-time superintendent Gary Seaborne, who served in the position for 27 years. For Cook, a Campbellsville native, it was all about returning home. Campbellsville and Taylor County are where he was born and raised. Starting his career in education at Campbellsville High School, coming back home brings his story full circle. Cook is not shy about telling his story. He has shared it on multiple occasions during board meetings. He grew up in housing projects near the Taylor County Schools campus. One of 11 children, Cook said he was one of four that didn’t drop out of school. After being drafted into the Army, Cook decided to make a career in education. He said he had several role models along the way that helped him shape his path. This year makes 41 years that Cook has been in education, starting his educational career in 1977. There were multiple stops along the way. He had stints as a football coach and teacher at Breckinridge County High School, East Hardin High School, and North Hardin High School. From there, Cook took his first administrative position at Russell County High School before becoming superintendent for the Russellville School District. He left Russellville in 2009 to come back home to Taylor County. While he said the Taylor County School District was in good shape when he began his tenure there, he said he feels like he is leaving it in even better shape. Looking back on his time at Taylor County, Cook said building the new schools (Taylor County Primary Center and Taylor County High School) are among his most memorable accomplishments, as well as improving test scores. Overall, Cook said he believes he has accomplished everything he aimed to when he first joined the district. But Cook did note that he did want to see the sports complex at Taylor County High School finished, and he said he hopes that it will get finished. The project is an expensive one, and Cook said that eventually, he hopes the complex can be finished. Cook is especially thankful that he was able to come back home to finish out his career. And while he said he loves his job and loves working in the school district, he said it is time for him to step aside. A major factor in his decision to retire was a desire to spend more time with his family. “I have five grandchildren and daughters,” he said. Cook said he still plans to remain active in retirement. So what does he plan on doing during his retirement? Possibly traveling, hitting the golf course, and maybe even picking up another job working in construction or a similar field. Cook also mentioned doing more presentations on personalized learning, a concept that he heavily implemented during his time at Taylor County, as well as consultation work for school districts. With Cook stepping aside, there will be some questions as to who the next superintendent of the district will be. That decision will be left to the Taylor County Board of Education, but Cook said he hopes to see assistant superintendent Charles Higdon be the next superintendent. Cook said he hopes whoever is chosen to lead the district after him will continue to provide many opportunities for the students of the district. “If not, I’ll be on the front seat of every board meeting, and I won’t be happy,” Cook said. As Cook’s time with the district winds down, he hopes he is remembered as someone who was a little unorthodox and worked hard for the district. But more than that, Cook said he hopes he is remembered as someone who truly cared about the students of the school district. As Cook’s journey comes full circle, he said he is thankful for the opportunity to serve as superintendent of the Taylor County School District.